The horrors of W.W. 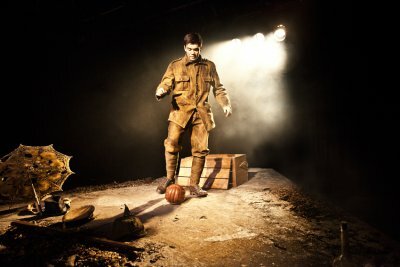 I are revisited in this moving and superbly performed solo play about the improbable camaraderie between British and German troops. A boyish, handsome young man wearing the drab khaki uniform of a W.W. I British soldier is sitting on a crate on the bare black walled stage. He is cleaning his rifle and also performing other tasks silently when the audience enters for the performance of Our Friends the Enemy. Soon wistful piano music is heard and this solo play begins. 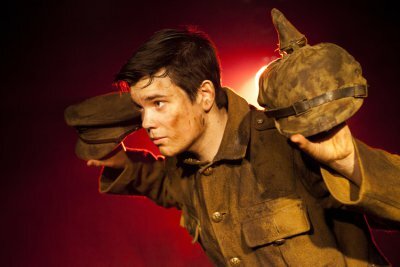 Using a cheery working-class accent for this everyman figure and playing other characters, the magnetic Alex Gwyther holds forth for nearly an hour during this haunting dramatization of The Christmas Truce. It is December 1914, W.W. I had begun four months earlier and during the week before Christmas reportedly 100,000 British and German troops on The Western Front participated in a cease-fire characterized by convivial exchanges. These included singing carols, giving gifts, entertainment shows, and football matches. It was all a display of universal camaraderie that diminished as the war went on and was replaced by incessant brutality. Mr. Gwyther also wrote this poetic documentarian work in the form of diary entries and letters that weave eyewitness accounts into an engrossing and moving narrative. He plays the good-natured Private James Boyce of the 1st Queens Regiment, Surrey. It is through his eyes that we experience the alternating horrible and light-hearted episodes of those days. Besides playing Boyce, Gwyther depicts other British soldiers as well as Germans. It is an exhilarating display of rapid vocal and physical transformations subtly giving each brief characterization a fleeting depth. With his angular features, intense eyes, expressive voice, and limber physicality, his performance is a superb display of riveting solo theater acting. Director Tom O’Brien’s efforts are an exemplary work of stagecraft. The trenches, carnage, lice, and mass graves as well as the happy interludes are imaginatively suggested. All of the production elements are precisely coordinated resulting in striking imagery and moods that surround his well-paced actor. David Goldstein reproduces Derek Anderson’s original lighting design for this production. Through strategic shifts of brightness and darkness it vibrantly conveys the sense of time and place. The production design of James Hirst with its black décor, rust colored rug, and crate, simply and powerfully suggests the battlefield. Gunfire, crashing grenades, and musical portions are melded into an evocative aural panorama by David Gregory’s highly skillful sound design. The accomplished musical compositions by Darren Clark are timelessly elegiac and also jauntily of the era. Our Friends the Enemy was first presented in London in February 2013 and was performed at the Edinburgh Fringe Festival and has toured extensively throughout The United Kingdom. My Mother sent me two pairs of socks. It was a delightful surprise. I’ve never been so happy to receive socks in all my life. Today, our reserve lines were being stockpiled with more men and ammunition. There’s word in the trench that we are to commence a full-scale attack in the next couple of days. I don’t see us being home in time for Christmas. Despite what the papers may say. This New York City premiere coincides with the holiday season and offers a sobering alternative to traditional Christmas time theatrical presentations. That it is also a superior work showcasing the wondrous talents of Alex Gwyther adds considerably to its virtues.